Yes we can surely accommodate your needs no matter what they are, we are very flexible and try our best to make anything work. 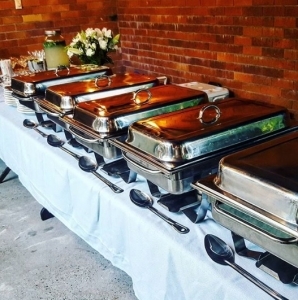 It’s our goal to do what it takes to offer the best catering services in town. 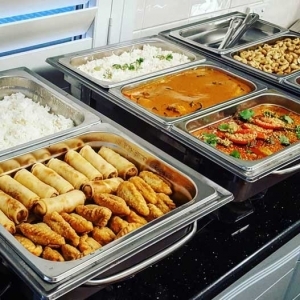 Your food is delivered and setup in stainless steel bain maries that have candles that keep the food warm for 3 hours, we do not require electricity or bring gas bottles on site. Your guests can serve themselves from the bain maries as they please, we provide serving spoons for each meal. Special dietary requirements are not a problem, most of our food is Gluten Free and we regularly cook Vegetarian and Vegan. Typically we would recommend a curry of your choice, a stir fry, fried rice and steamed jasmine rice. 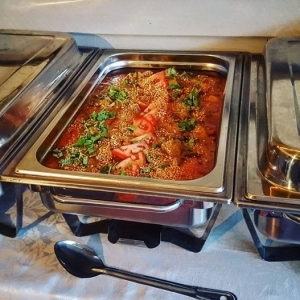 Standard Pricing include vegetarian, chicken, beef and pork dishes, if you would like Lamb, Duck or Seafood as these are more expensive meats we can give you an exact quote depending on numbers. We like to remind people to organise disposable dinnerware, it makes for an easy cleanup, The Reject Shop have decent quality plastic plates and cutlery for very cheap. We do NOT require a deposit or upfront payment, once you are happy to go ahead all we ask for is a credit card number which we hold securely and only process on the morning of the delivery.